Without question the closest source for used records to my home, I have visited this shop a couple times and outlined my trips accordingly for those visits. For this fourth visit (and 9th Savers visit overall, including other locations) I really came up big. It had been since last fall when I previously dug the bins and again I came up big. I have trouble accepting that Savers has some coporate policy to accept only legit records (unlike the junk you spend most of your time sifting through at Goodwill or Salvation Army) but I have had many fruitful hunts at these stores, and this location in particular. In fact, I came up on a boat load of good stuff that I actually had to turn away because I already had it! -The Engelbert comps are always a treat....to find a duplicate at the same time is unheard of. -I only started collecting the Baja Marimba band albums not long ago and already have this one but its condition is so impeccable it was tough to leave behind. -'Last Of The Romantics' is a true gem, I don't know that I have EVER seen this in any record or thrift store. In fact, I bought mine on ebay out of frustration just around the time I visited this Savers last. Still holding out for the picture disc. 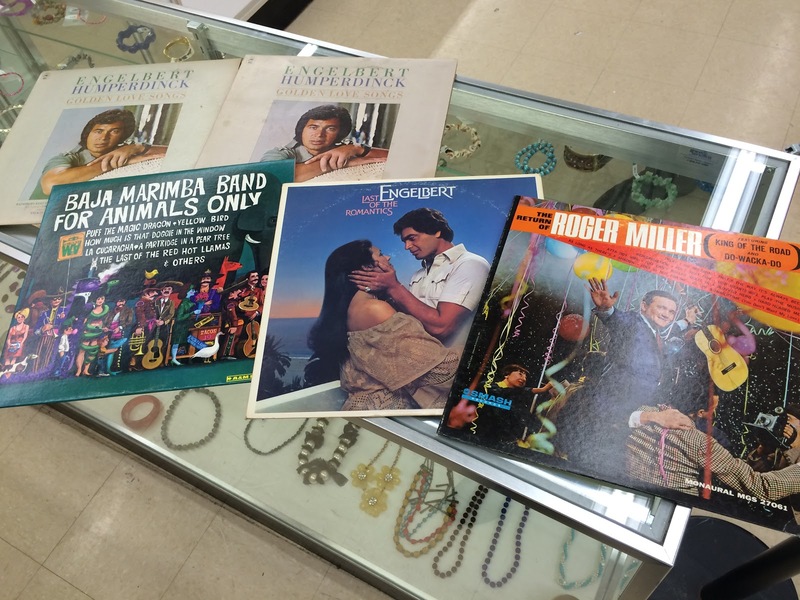 -I already have this Roger Miller album and ironically also in mono - which you would think might be more rare. It isn't; I even found another copy a couple months ago which I got for my girlfriend. I am still on the lookout for the stereo version. I found another copy of 'Enter Center Stage' which I still cannot believe. This one is not autographed as my own copy is but I would continue to buy these long after they had monopolized all the square footage in my home, if they continued to present themselves to me such as this. I grabbed the copy for my girlfriend. Earlier this summer I passed on a sealed polka album. I did plenty research since and found that it is a homegrown artist who sadly is no longer with us. However, he literally spent his life releasing a bevy of albums with great regularity for 30 years straight! I found not one but two albums at Savers - had to grab them both. I won't be passing up any more Versatones albums in my hunts, believe me.